Since the heyday of the Chicago Bulls in the 1990’s, when we as sports fans were lucky enough to watch the growing and incredible legend of Michael Jordan dominate the sports scene, I have never had a basketball team that I have cheered for. My allegiances typically rested with whoever was playing against a team that I didn’t like. Who are the Lakers playing in the Finals? The Pacers? Sure, I’ll cheer for them. Or whoever was playing against the Miami Heat during the days of the Big Three. Like most people on Earth, I cheered for the Dallas Mavericks and San Antonia Spurs to beat them in the Finals. Being Canadian, it was always difficult to buy into the notion of the Toronto Raptors. They came in as a terrible expansion team, along with the ill-fated Vancouver Grizzlies, but even after the Griz left town, the Raptors were never truly marketed as being Canada’s team, even though, by definition, they are. They were a team in Toronto, and if there is anything that Canadians like doing, it’s cheering against anything that comes from Toronto, our most pretentious city. So the Raptors were dead to us. They had a stupid, gimmicky name, they had terrible jerseys with poor colour choices, and they were bad. Like, really bad. For a long time. With only a couple of glimpses into the playoffs, and no superstars since the day Vince Carter walked out of town, they were a tough team to cheer for. But things are slowly changing. Rapper Drake has taken on a role with the team, and they are going through a slow rebranding of the team. 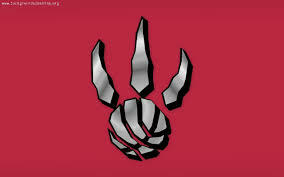 Sure, they are apparently sticking with the Raptors moniker, but they are going to go through an image readjustment in hopes of making them the team for Canada to cheer for. Despite the grammatical inadequacies of the statement, “We the North” has been something that has brought fans of the sport together behind our one and only team. It has managed to move the Raptors from being a silly Toronto team, to one for all Canadians. 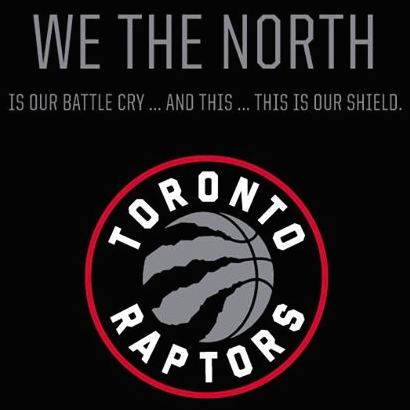 Well played, Raptors PR department. Yesterday, the new logo for the team was unveiled, along with some colour changes. While the logo is very simple, and far too reminiscent of the Brooklyn Nets for most people’s liking, there is some potential there. And that potential is the gold. With a new colour scheme that will be black, silver, white, and red, there is already a rumoured alternate that will be black and gold. I say forget about the alternate aspect of it. Be black and gold. Nobody else has it. It would look cool; it would look new. The black and white is done, and basically owned by the Nets and Spurs. Toronto is not Brooklyn. It needs to continue forging its own identity, instead of trying to be too much like somebody else. 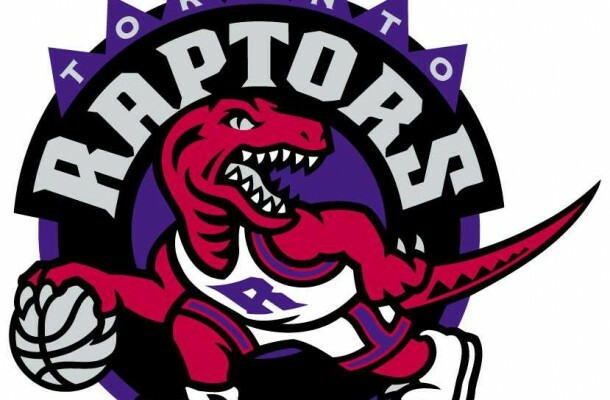 The days of the purple are behind us (even though now that they have made a reappearance as retro jerseys, those old monstrosities from the early days have somehow become kitschy and cool), and it is time for the Raptors need to stake their claim on something original. Most North Americans know the story of the use of professional athletes in the basketball tournament of the 1992 Olympic Summer Games in Barcelona, Spain. The United States basketball team, known as the “Dream Team,” consisted of the likes of Michael Jordan, Larry Bird, and Magic Johnson, all together on the same team for the first time. They demolished the competition on their way to the Gold medal, to the surprise of nobody on Earth. But there was another story going on at the same time, and one that was more important for the political state of the world, and for basketball itself. It was the other dream team. The group of men from the new sovereign state of Lithuania, who had taken an unprecedented route to make it not just to the Olympics, but to that point in their lives altogether. The Other Dream Team is a documentary that tells the story of what eventually becomes the 1992 Lithuanian Olympic basketball team, and the journey that they, and their country, took to get there. This film seamlessly blends the political story of Lithuania and its quest for independence from the Soviet Union with the stories of the players, who went through lives that cannot be imagined by most Westerners, just to play the game that they love. During the heyday of the Soviet Union, the majority of its “national” basketball team hailed from Lithuania, the small Baltic nation that had been annexed by the USSR during the Second World War. They had grown up under the harsh foot of communism, and they weren’t allowed to play for their own country, because essentially, their own country did not exist. But they felt that it did. Basketball gave some of the players the opportunity to travel to different parts of the world, enabling to see how Western life compared to their dreary Soviet existences. And it provided them with dreams, not just for themselves, but for the freedom of their country. Lithuania was the first nation to try and break away from the Soviet Union, declaring their independence before anybody else. They were a tiny nation, just hoping for the freedom that had been taken from them against their wills. This led to revolutions on the streets, and the world rallying around the case of this little country that most people had never even heard of before. 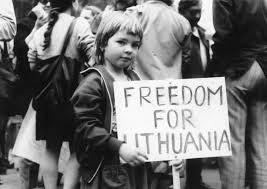 Lithuania was making a stand on the international stage, and people understood their plight, and rallied for their cause. This also led to the decision that Lithuania needed to have a basketball team at the Olympics, to announce their presence to the world, as a unified, and free country. With all of the political upheaval at home, there was no money for this, but the team found an unlikely source to help them out: The Grateful Dead. The Other Dream Team is an incredible story, about how this team took the world by storm. 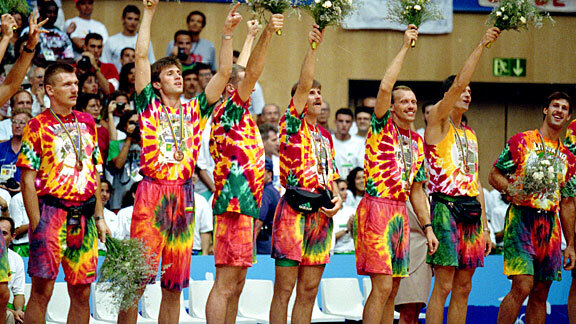 They were beloved at the Olympics, for their fun attitudes, and for their crazy tie-dyed shirts they wore, which had been given to them by the Dead, and had become their uniform off the court. The team embraced their new personalities, and the world ate it up. They were not underdogs because of their skill, but because of where the political landscape had placed them. This documentary takes us from the childhoods of the team, where they would build their own nets in dreary playgrounds, and the importance of the game in their lives. We see them grow, playing for the Soviet national squad and being tremendously successful there. The Soviet pro leagues are also shown, including the heated rivalry between the Lithuanian team and the menacing Red Army team, and the intense battles on the court they would face. The collapse of the Soviet Union, and the independence of Lithuania is woven perfectly into the storyline, as the battles on the court were always representative of the political battles being fought for the small nation. There was a feverish national pride in the country, and an intense love for the sport at the same time. We are also taken to the NBA, where some of the Lithuanian talent was being recognized by the biggest pro league in the world, and players were getting drafted, and slowly trickling over to America. The story crescendos to the Olympics, where the Lithuanians roll through the tournament, only to get wiped out by the American team. But that game did not really matter to them. Nobody thought that they were going to beat the US, including the Lithuanian team. That was not their goal. As usual, they had fun with it, even taking pictures of the famous American basketball players while the game was still going on. The Lithuanians were free, and they were representing their brand new country, and the millions of people back home, who had just had their hope restored. It was not the game against the US that mattered, it was the Bronze medal game against the Soviet Union (playing as the Unified Team, due to the collapse of the USSR), that would make all the difference. This was it. The small child playing against its imposing father, the one who had controlled it for so many years. It was absolutely more than just a game for a medal. 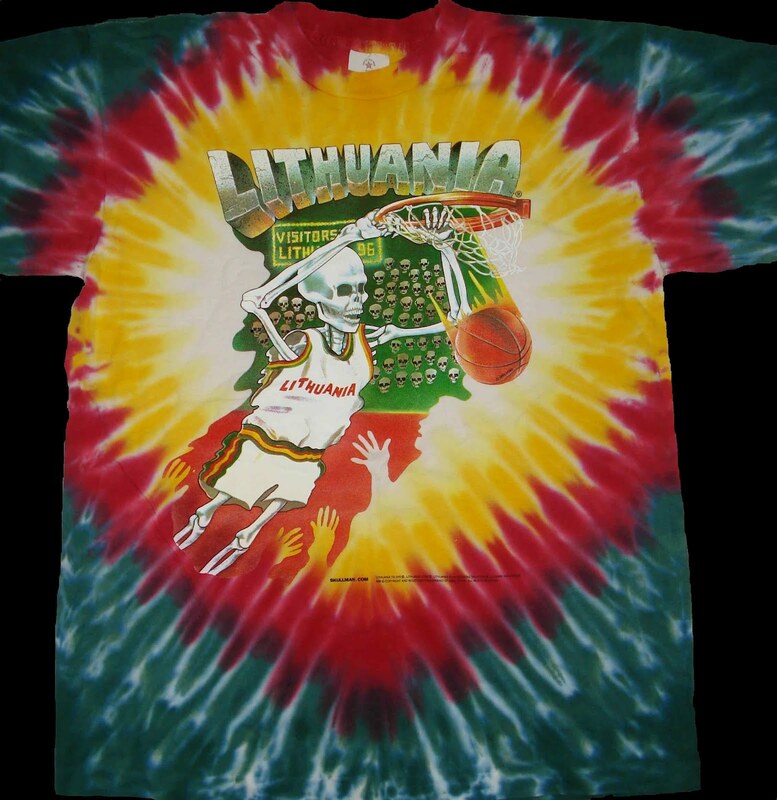 For Lithuania, it was everything. And The Other Dream Team manages to chronicle that struggle, both on and off the court, perfectly. A great sports documentary. 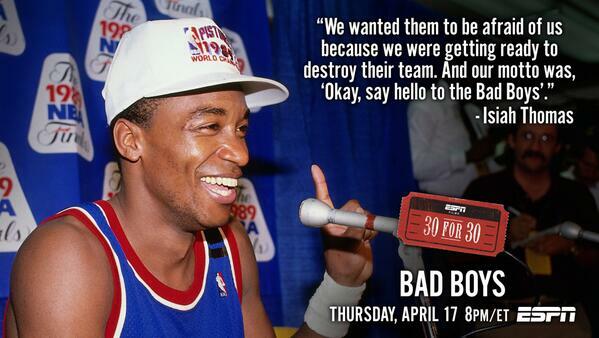 Perhaps the most interesting thing about the 30 for 30 documentary about the Detroit Pistons championship teams of the late 80’s and early 90’s, entitled Bad Boys, is the dynasties that they needed to overcome in order to become champions, and legends, themselves. The Pistons, a scrappy bunch of players that became renowned for their toughness and nearly brutal play, slowly got better over the years, but where faced with overcoming some of the greatest teams in NBA history. To even make it to the Finals, they had to get through the legendary Boston Celtics teams led by Larry Bird. If they did get past them, they were faced with the other dynasty in the league at the time, the Los Angeles Lakers during the height of Magic Johnson. No easy feat. Even when they managed to overcome these teams, there were other obstacles. Including a little team from Chicago that was led by the most dominant player in the game, Michael Jordan. The route the Pistons had to take to win their back-to-back titles was not an easy one. It was tough from the beginning, just as they were as a team. Bad Boys takes us on the journey of Detroit starting as a laughingstock in the league, a place where nobody wanted to play. But it was one draft pick, Isiah Thomas, that changed everything. Slowly, the team built themselves up, through a ton of trades, some free agent signings, and more solid draft picks (like Joe Dumars). Eventually, a monster was created, and the Pistons became perhaps the toughest team in the history of the league. People hated them, thought they were dirty, and goons. Which was completely fine with all of the players on the team. If you were thinking about them and their rough play before taking the court, then they had already won. The game of the Pistons was at times more psychological than physical. But the physical was there. They abused superstars, forced legends to their breaking points, and made teams pay for every point that was scored against them. And it made them almost unbeatable for a time, cementing their place in history in an era that had been dominated by Bird and Magic, and was soon to be completely owned by Jordan and the Bulls. 30 for 30: Bad Boys provides the background to the team, and it is interesting to see how their relationships all worked. Their personalities did not always mesh, but they always had a common goal: to win, and to be the best. Talent-wise, these Pistons were not the greatest. There was definitely skill, but it was their hard work that made them the best. Hearing the behind-the-scenes clashes and issues that the team had, their true opinions of themselves and their opponents, is another feather in the cap of the ESPN series. They have managed to get good, and honest, interviews from the players that lived that experience, and they reflect back on their time as the champs with glee. They took pride in being hated, of being the bad boys of the league, and of being able to instill fear into the hearts of others. 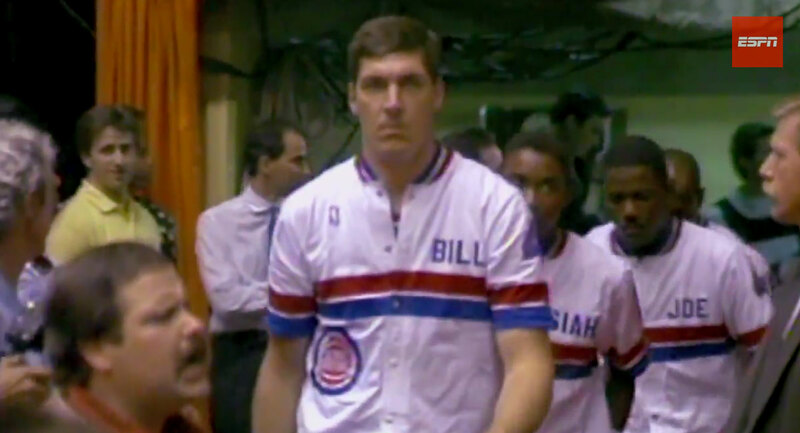 The segments with Bill Laimbeer were truly great. Had it not been for these Pistons teams, perhaps Jordan would have never learned what it took to be a champion, to understand the physical abuse that had to be taken in order to be the best. Regardless of their impact on others, the Pistons deserve their own spot in history/infamy, because they did win the title in back to back years, after falling short in their first trip to the Finals. Their struggle was intense, and endeared them to an entire city that needed someone to embrace at the time. Yet another winner in the 30 for 30 series. I am not a very big basketball fan, to say the least. I find it difficult to watch games on TV, as, like many people, I find they drag on in the waning minutes of each game, where each team seemingly has an endless supply of timeouts, and a final minute can take a half hour to play out. I have been to a couple of NBA games, and find the in-person experience much more entertaining. I follow who the stars are, and can tell you who won the championships in each year, but that might be it. For me, like millions of people, the heyday of the league was during the days of Michael Jordan and the reign of the Chicago Bulls, when every kid with a basketball hoop on their driveway was a Jordan fan. For me, those days are long gone. But I have been trying to pay more attention to basketball over the past couple of years, even engaging in a fantasy league that I inexplicably won (I had Kevin Durant, and I’m pretty sure that’s what did it for me). Like the rest of the sporting world, I have been following the LeBron James Decision 2.0, and have opinions, just like any other fan of sports. Today, James announced that he would be leaving the Miami Heat for his former, and hometown, team, the Cleveland Cavaliers. And this is great news. For a few reasons. Like many people, I had been trained to hate the Heat after they created the Big 3. Cheering for them would be like cheering for the New York Yankees, a team that simply buys themselves a championship, and seems to be devoid of a soul. We all knew what Miami fans were. Fringe fans, who would only go see a winner. Their attendance records over the years definitely reflect this. They didn’t seem like a city worthy of having such a dynastic team. And the Heat did well, the experiment worked. They went to four straight finals, and won two of them. Sure, they probably should have won all four to make themselves legends, but that is still a pretty impressive record, leaving the rest of the Eastern Conference chasing them since the day James told us he was taking his talents to South Beach. With his return to Cleveland, James is coming home. 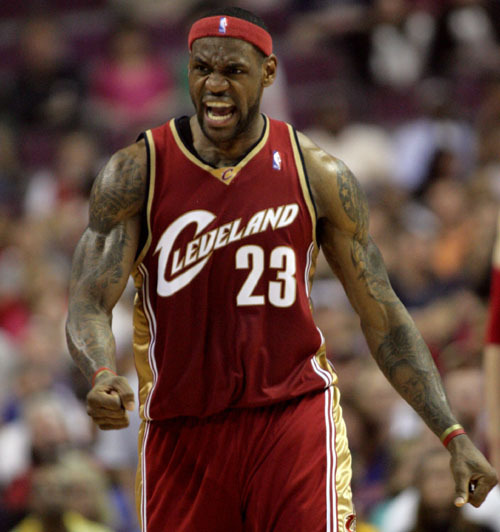 He is from Akron, was drafted by the Cavs, and spend the formative years of his career there. They even went to the finals once, getting rightfully whipped by the Lakers when they got there. But now, the Cavs are a team on the rise, and having the best player in the world rejoin them makes them an immediate contender. They are a young team, and in a couple of years, if they are able to keep it all together, they have the look of a team that can win year after year, giving the downtrodden fans of Cleveland something to cheer for in their title-less town. James will join a plethora of young talent, and a group of fellow #1 picks. Kyle Irving, Anthony Bennett, and Andrew Wiggins (unless he is traded for Kevin Love) will be a part of the future that will soon dominate the league. This is to go along with Tristan Thompson and Dion Waiters as well. Seems like a pretty good group. If they can grow together, they will truly be a force to be reckoned with, and the Cleveland championship drought should end at some point. They are good side pieces to the best player in the game, which, let’s be honest, is important in basketball, where having one great player is enough to make you a good, contending team. I believe that LeBron made the right choice by going home. He should probably have never left Cleveland in the first place, as it made him look like a mercenary. He was the best player in the league, and should have convinced others to join him in Cleveland, instead of him packing up and moving somewhere else to chase a title. It made him look less great than he really was, like he was the piece, instead of the centerpiece. If, and more likely when, he wins in Cleveland, he will be a legend. Going back to a small market makes him look like a better person. Trying to win for his home makes him look like someone who truly cares about Ohio. And this is good for him. With one choice, James has, in my mind, gone from being one of the greatest villains in the NBA, to one of the good guys. He is already cleaning up his image by making this choice. It will be easier to cheer for him now that is a Cav again. In the same way that it was always easy to cheer for Jordan, even though it is in our nature to hate the greatest player and the greatest team. In another way, this is a cool thing for the Canadian basketball fan. The Canadian Cavaliers, with three Canucks on their roster, were already on their way to becoming Canada’s Team (except for those few people outside of Toronto that actually cheer for the Raptors). Now, it is much easier to cheer for them, because we know that they will be good. It is nice to watch our homegrown talent play at the highest level, it is even better to watch them when they aren’t completely terrible. In my opinion, the Return of the King is nothing but good things. It brings a star back to where he belongs, it ruins a troublesome partnership in a city that is tough to cheer for, and it turns a villain into a returning hero. Great choice by LeBron, and it will be interesting over the next few years to see how well the Canada Cavaliers are able to do. I may still be a fringe fan, but this one move is something that could help draw my interest back to the NBA. Chicago is a great American city, one that is deserving of all the kudos and reviews that it receives. It is a start where there is tons of art, great food, incredible music. And, Chicago is one hell of a sports town. The NBA Bulls had their magical run of championships with Michael Jordan at the helm, creating a modern dynasty with two 3-peats in the 90’s. The Cubs, despite their century of futility, are still one of the most popular ball teams in the States, and have provided some memorable moments over the past years, finding new and impressive ways to lose. The Blackhawks of the NHL have come back from the depths of brutality to become a true force in the league, winning Stanley Cups in two of the last three years. The Bears may not be winners, but they are a consistently strong and beloved team in the city. Oh yeah, there are also the White Sox. The forgotten team in the great city. Sure, they are more successful than the Cubs, even winning an improbable World Series in 2005. But they continue to be the second team in a two-team baseball town. While the Cubs are nestled in the comforts of Wrigleyville, the White Sox are stuck out seemingly in the middle of nowhere. The stadium is near a subway station (or semi-near, anyways), and a massive parking lot, which takes away from any surrounding splendor that so many other modern ballparks are becoming known for. Even though it isn’t, The Cell seems like an old concrete beast reminiscent of the stadiums built in the 70’s and 80’s. It is really far nicer than they were, but being in such an open space gives off such an appearance. Walking into the stadium, there is a lack of the same sense of awe that other ballparks have created. It is a nice place, and doesn’t at all seem dated even though it was built in 1991 (which is now considered to be an older stadium, with so many teams getting brand-spanking new parks in the last decade). One major flaw with the stadium, is the brutally chilly winds that soar in from the outfield. Granted, the day I watched a game there, it was already a cold May day, but the wind made it frigid. Instead of consuming my usual amount of beers (a lot), we were forced to drink coffee and hot chocolate to warm ourselves and our freezing cold hands. In fact, it was so cold that day, that even though there was a double-header, we could only muster the first game against the Seattle Mariners. This was coming from a couple of Canadians who were definitely used to the cold. The amenities at The Cell are fine. The food is solid, and it was a pretty sparse crowd there, so the lines were always quick and reasonable. The team shops inside were pretty good, although much smaller than I had seen at other parks. If there were a sellout during the playoffs, or another highly intense and important game, I could see it getting a little ridiculous in there. As far as pricing went, it was a far cheaper place to see a ballgame than at Wrigley Field. The tickets are definitely reasonable, as we had decided on seats along the right outfield side, not the usual up-close and personal seats we had become accustomed to. The sightlines were solid, and the seats themselves were as comfortable as anywhere else. 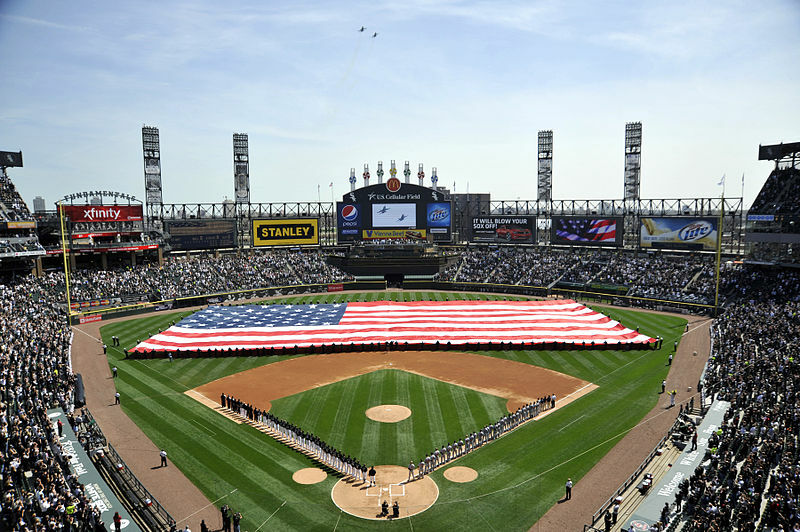 Overall, there is nothing to complain about at the New Comiskey. Wandering through the outfield, there are some cool statues and things to look at, but it really did lack the panache of other parks. 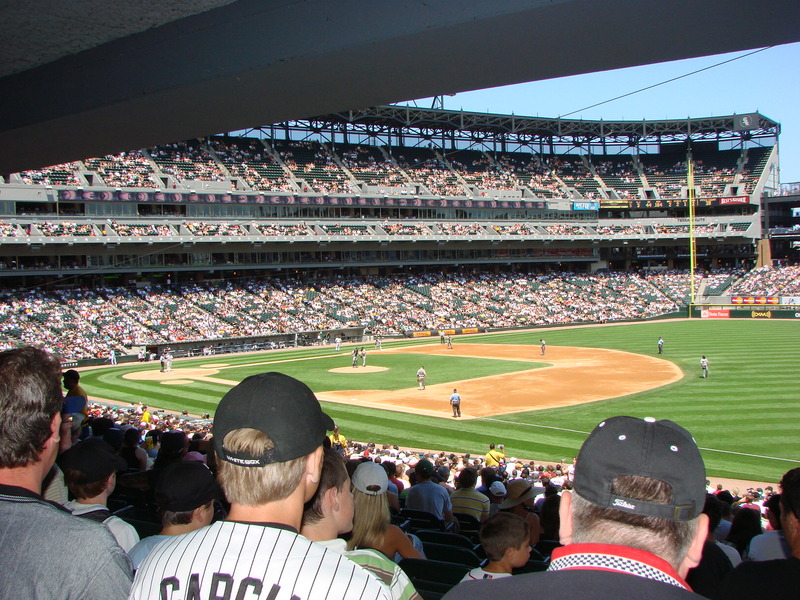 While the White Sox have been better than the Cubs over the past decades, based on their home, it is understandable why they are the more ignored of the two teams. A good stadium, a solid team, but it truly seems to lack soul. So the NBA has been having teams wear uniforms with sleeves over the past couple of years. Ok, maybe the teams haven’t been forced to wear them, but on all the Christmas games this year, the teams are sporting them. And they look ridiculous. I get why the league is doing this. There will be people out there that enjoy them, and there will be people that buy them. But they look like PJs. I can see them having appeal to a fan of a team that doesn’t want to walk around rocking a no sleeve look. But for on the court, they look impractical, and made even worse by the contrast of the tight jersey tops and the baggy shorts the players still wear. Save these ones for the stores, NBA, and save us from having to see them on the court again. 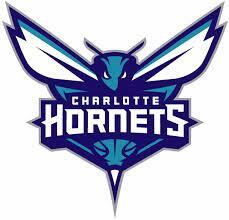 Despite not being a massive basketball fan, I was excited when I heard that the Charlotte Bobcats would be rebranding themselves as the Charlotte Hornets once again to begin next season. In a complex series of team moves and name changes and whatever else, Charlotte will get their name back, and their team will get their initial identity back, after years of having perhaps the most boring team name and uniform set in North American professional sports. Bringing back the name and the original colour palette of the 90’s Hornets, teal and purple, will bring us back to the glory days of the franchise, when Larry Johnson and Alonzo Mourning patrolled the floor for the tough and competitive team. Not that a colour change will do much for the team on the court, but it seemingly will re-energize the fans, and give the team a true identity moving forward. It can’t make them a better team, but it will make them feel like a better team. The new logos were released yesterday, and they look good. The brightness is there, and it is simply an update version of what they had before. The logos are sharp and interesting, and I think they definitely have winners here. There will be a few people out there who will be able to dust off their old Starter jackets and wear them with pride once again! Finally, the Hornets name is back where it belongs, and they look great.